The image below shows part of a series of showcases in the zoo "Dierenpark" in Emmen, The Netherlands. 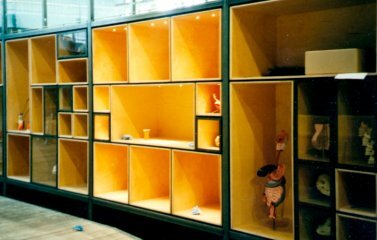 These showcases will display various preparates of skins and small animals are displayed. Each showcase is lit with a single 100 Watt Tungsten projector that is mounted below the showcase. At the time that the picture was taken, the showcases were still being constructed. In fact, the photograph records a "burn-in" test of the projector and the optical coupling. It is essential that the fibre endpoints in the optical coupling are sufficiently polished to minimize loss of light energy at the entry point. 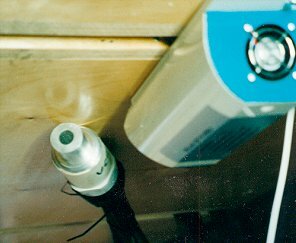 The optical coupling is mounted directly in front of the Tungsten lamp in the projector. Any opacities at the surface of the fibres cause light energy to be absorbed and converted to heat (instead of the light energy being transported to the other end of the fibre). This does not only reduce the amount of effective light at the other endpoint; worse, sufficient heat, in turn, causes the plastic fibres to melt. The term "burn in" test is thus literal: if the optical coupling was not appropriately polished, cleaned and degreased, it will indeed "burn". The second picture is shot from below the showcase and it shows the projector mounted onto the bottom (the projector is switched off in the picture). The optical coupling is visible as well. This coupling holds 228 fibres with a diameter of 0.75 mm each; the dark circular spot in the middle of the optical coupling is the polished surface of the bundle of 228 fibres. Behind the optical coupling (not shown), this single bundle splits into 19 "light cables" with 12 fibres each. As an aside: in normal operation, the optical coupling is plugged into the projector. 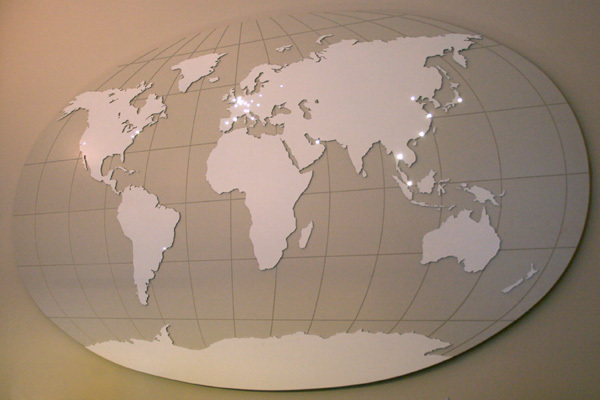 Fibre optics are well suited to create large number of miniature light points, such as star ceilings or illuminated points on a map. The fibers have a diameter that is smaller than that of LEDs. A sparkle weel keeps the light points "alive" by varying the intensity in a pseudo-random manner and a colour wheel adds effects of colour waves over the light points. For fibre optics, the light source is a projector with a strong lamp, usually Tungsten. The projector focuses the light through a reflector (and sometimes a lens) into a bundle of fibres; these fibres are typically thin made of high quality glass or plastic material. Currently, fibres made of PMMA (polymethyl-methacrylate) and with a diameter of 0.75 mm are commonly used. Each light endpoint consists of one or more fibres packed in a bundle. Between the projector lamp and the optical coupler (at the projector), a colour wheel and/or a sparkle wheel can be fitted for lighting effects. PMMA is a transparent plastic with an excellent light conductivity. An additional advantage is that it is more flexible than glass, so the fibres can take sharper bends. Note though, that there is a loss of light intensity at a sharp bend. Both fibres of glass and of PMMA loose light intensity per meter. In addition, the intensity loss depends on the wave length of the light, meaning: colour shifts occur in long stretches of fibres. With glass fibres we see a colour shift towards green after approximately four meters; PMMA fibres give a colour shift towards blue after approximately eight meters. The fibres discussed so far are of the "end light" type: light that enters the fiber at one end comes out at the other end, and only at the other end. No light escapes from the side of the fibre. There also exists fibre that emits light at the cylindrical side; these fibres glow over their entire length. The loss of light per meter is in such "side light" fibre, of course, much higher than that of end light fibre. In contrast to LEDs, the fibres cannot be individually switched on or off. A single standard projector drives up to several hundreds of fibres. An in-between alternative is to use several tiny LED projectors instead of a single large projector. As the LED projectors produce little heat, their construction is much smaller than that of the common Tungsten projectors. Mounting a single fibre on a LED is also an option.